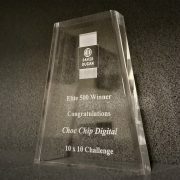 Recently Choc Chip Digital was awarded the Elite 500 David Gugan award for it’s recent efforts in the 10 X 10 challenge. This award highlights Choc Chips fantastic work in business best practices and entrepreneurial work within the local community. We are excited about the future of Choc Chip Digital and have our eyes set on a bigger and better 2017, continuing to service the local Geelong and Surfcoast business community with powerful websites and online marking which makes an impact! If you are have a tired outdated website that’s failing to achieve your business needs or you are looking to take your business to the next level get in contact with us here at Choc Chip Digital though our website, email or call us on 5234 5360 .